Nebraska is definately a sleeper state for big bucks, but you still have to hunt in the right area and with folks who know how to do it. 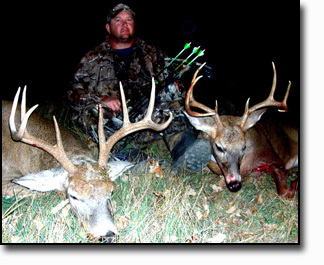 Archery deer hunting in Nebraska can be a very rewarding and successful hunt if done right. At Gobble-n-Grunt we started in 1991 by offering bowhunting only for whitetail deer. These hunts remain our specialty. Most of our properties are either bought or leased with bowhunting in mind. The high game densities of the Missouri, Niobrara and Keha Paha rivers as well as various oak filled creekbottoms create an exceptional bowhunting opportunity for hunting Nebraska's trophy whitetails. 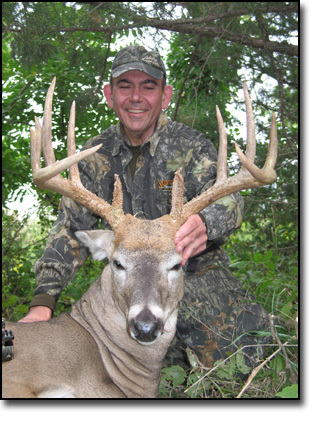 We are avid bowhunters ourselves and have a long history of putting hunters on trophy whitetails. So whether you are looking for a September feeding trail type bowhunt, or an early November pre-rut hunt, a tremendous Nebraska archery whitetail hunt awaits you at Gobble n Grunt. 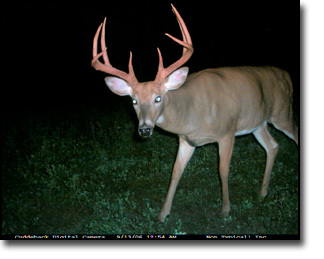 We offer a one or two buck limit on our archery deer hunt. We don't have any minimum buck size. You shoot what is a trophy to you. We simply ask that on the two buck limit hunt that your second buck be larger than your first. If you are tired of bowhunting in areas that just aren't producing quality whitetails for you, you need to call us to arrange a Nebraska archery whitetail hunt for you. Book Now! Season dates: September 1 - December 31 excluding the 9 day gun season in mid-November. Click here to learn how and why Gobble n Grunts Archery hunt continue to be so successful year after year!